Miami, FL (November 13, 2018) – The Nature Conservancy is announcing the launch of the #RespectOurReef campaign, an effort to raise awareness of the challenges facing Florida’s Reef System and encourage those who know and love the reefs, local divers and anglers, to pledge their support for a broad-based, grassroots effort to educate the public on how they can help preserve this beloved natural treasure. 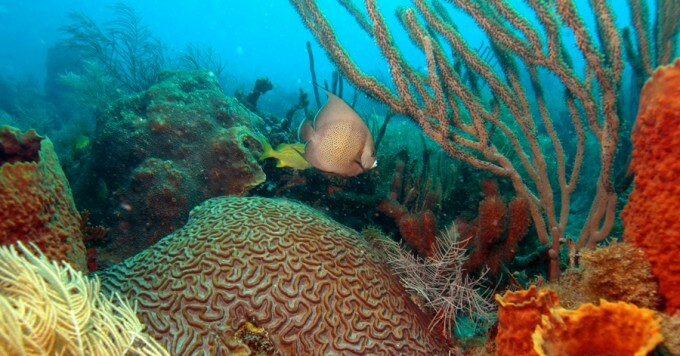 The Conservancy is coordinating the effort for the Florida Reef Resilience Program, a consortium of federal and state reef management agencies, nonprofit organizations, science and educational institutions committed to protection and sustainable uses of Florida’s coral reefs. The #RespectOurReef campaign officially went live this month and is employing a two-pronged approach to meet its goals. It includes a robust social media awareness campaign targeted at those who enjoy and benefit from the reef system off south Florida’s coast: recreational divers and anglers, commercial fishermen, charter captains and diving businesses that depend on a healthy reef for their income. The second piece of the campaign is a newly-created Respect Our Reef webpage (nature.org/respectourreef), which includes helpful tips for smart diving and fishing practices that will minimize human-caused damages to the reef system. Importantly, the new webpage includes an online pledge for divers, anglers and others to join the #RespectOurReef movement and help spread the word. The campaign and website launch are made possible by funding from the National Oceanic and Atmospheric Association (NOAA). The importance of the Florida Reef System can’t be overstated. The reef supports more than 70,000 Florida jobs and $6 billion in economic benefits for Floridians in Southeast Florida and the Florida Keys. Dive shops, fishing charter operations, hotels, restaurants, and other related businesses all depend on the unique natural system for their livelihoods, underscoring the urgency of protecting the 358-mile-long reef system from further manmade damage. With risks to the health of reefs caused by disease and bleaching, it is even more critical to act to minimize the dangers we can easily control. To learn more about the Florida Reef Resilience Program, please click here. For Respect Our Reef photos and video, please click here. The Nature Conservancy is a global conservation organization dedicated to conserving the lands and waters on which all life depends. Guided by science, we create innovative, on-the-ground solutions to our world’s toughest challenges so that nature and people can thrive together. We are tackling climate change, conserving lands, waters and oceans at unprecedented scale, and helping make cities more sustainable. Working in 72 countries, we use a collaborative approach that engages local communities, governments, the private sector, and other partners. To learn more, visit nature.org/florida. In Florida since 1961, with support from our members, we have helped protect more than 1.2 million acres of vulnerable lands and waters across the state. We own and manage more than 52,000 acres in 25 Conservancy preserves in Florida. #RespectOurReefs – Information on the #RespectOurReefs campaign is now available by clicking on the Respect Our Reefs page listed on the menu above.